Aging or senescence in biology is defined as the process of gradual loss of important body functions and cells, and in particular, the inability of cells to reproduce and cope with stress. Important features of an aging cell include the progressive accumulation of damaged proteins, abnormal protein aggregates and oxidative stress. Such features may damage macromolecules and trigger two genetic programs—cellular senescence and apoptosis. 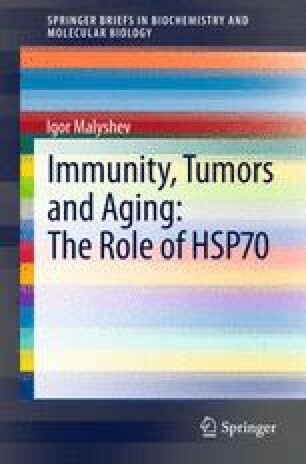 HSP70 limits cellular aging by: (i) ensuring the refolding and disaggregation of denatured/misfolded proteins; (ii) participating in the degradation of irreversibly dysfunctional proteins; (iii) mediating the effects of histone deacetylase 6 in the starvation-induced increase in life expectancy; and (iv) preventing cell senescence and apoptosis. However, cells of an aging body display a dramatic reduction of HSP70 inducibility. This reduction correlates with a decrease in the ability of cells to cope with stress. The reduction of HSP70 inducibility most likely reflects the launch of a special genetic program aimed at the activation of JNK-dependent apoptosis and the destruction of old cells, which have accumulated damaged proteins and dangerous mutations. Such a program functions to protect the body as a whole.